If you love to spend time in the kitchen baking delicious meals or desserts, you need a top-quality bakeware set. Stocking your cupboards with the right bakeware set can give you all of the essential tools for achieving baking success whether you’re baking cupcakes for a school bake sale or a homemade pizza for a yummy weeknight dinner. For some people, baking is a fun, stress-relieving hobby that comes with delicious results. Others bake to provide healthy, wholesome meals for themselves and their families. Still others are masters in the kitchen and consider the finished products of their baking endeavors their own kind of art when they finally come out of the oven. Whether the role of baking in your life is as a hobby, a necessity, or an art, these top-quality bakeware sets can help you maximize the ease and efficiency of your baking endeavors while ensuring the most delicious results. In this professional 10-piece bakeware set, you’ll find 2 cookie sheets, two 9-inch round cake pans, 2 9-inch square baking pans, a two-piece meatloaf pan, a traditional muffin pan, and a 9-by-13-inch rectangular baking pan with a lid. All of the pieces in this set feature nonstick surfaces for easy clean-up and effortlessly transfer in and out of the pans. They are made from ultra-durable carbon steel material that heats everything evenly to ensure the tastiest results. A nice added finishing touch on this bakeware set are silicone grips for more transport security and less heat transfer, even though the bakeware pieces themselves are oven-safe up to 450 degrees Fahrenheit–silicone grips and all. 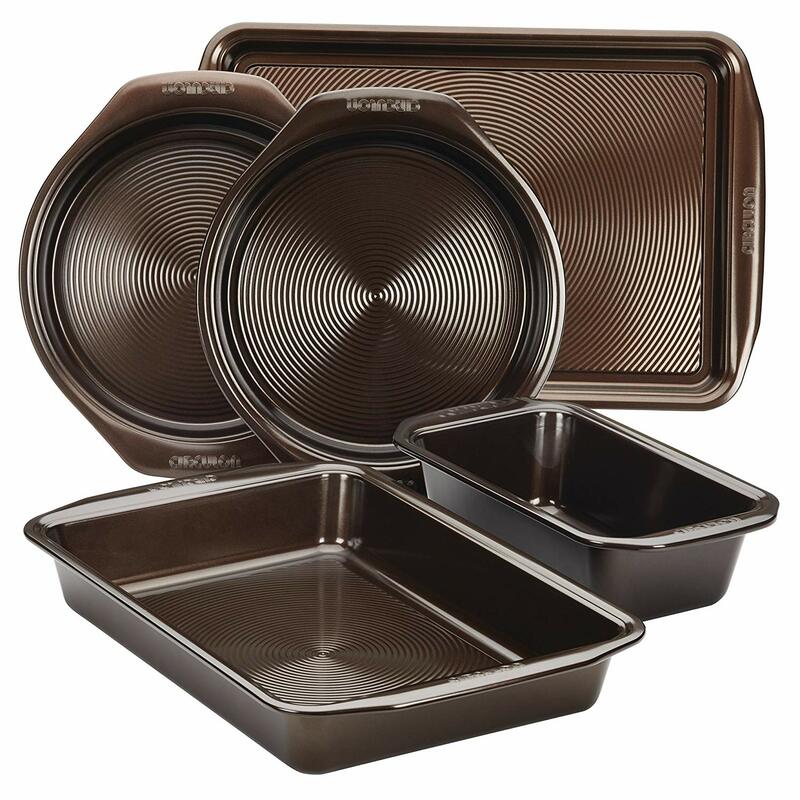 This bakeware set includes a loaf pan, a 9-by-13-inch rectangular baking pan, a 12-cup muffin tin, a cookie sheet, and 2 8-inch round cake pans. 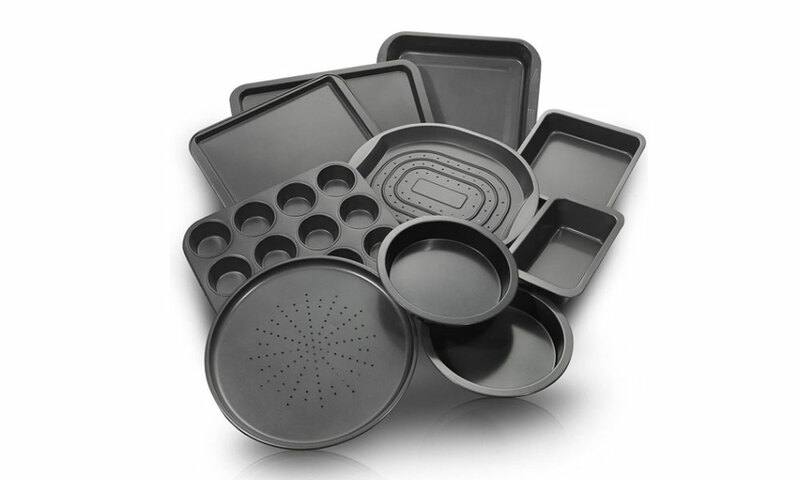 A heavy-gauge steel core maximizes the durability of these bakeware pieces. It ensures that everything you bake in these pans heats evenly. This steel core also ensure that these pans won’t warp, even at very high heat. In fact, all six pieces in this bakeware set are oven-safe up to 450 degrees Fahrenheit. Interlocking nonstick layers make up the interior of these pans to ensure easy cleanup with stain-free, odor-free results. This efficient, versatile 5-piece bakeware set includes 2 9-inch round cake pans, a 9-by-13-inch rectangular baking pan, a cookie sheet, and a 9-by-5-inch loaf pan. Just these five pieces provide all the tools you need to take care of a good portion of your baking needs. Heavy-gauge steel makes the pans in this 5-piece bakeware set ultra-durable. Its nonstick surface makes baking–and cleaning up after yourself–faster, easier, and less frustrating. Their wide handles prevent drop-on-the-floor disasters and allow you to maintain a good, secure grip on your pans even if you’re wearing thick oven mitts or using a large potholder. Also, the chocolate brown color of the pieces in this bakeware set is warmer and more inviting–as baked goods should be–than cold gray steel, but dark enough to hide any stains or discoloration over time. This expansive 15-piece glass bakeware set provides every tool and utensil you need for your baking endeavors, whether you’re whipping up a chocolate birthday cake or prepping a casserole for dinner. It includes a 1.5-quart casserole dish, a glass casserole dish lid, a 1.5-quart loaf pan, a 1-quart mixing bowl, an 8-ounce measuring cup, a 9-inch pie dish, 4 6-ounce custard cups, 4 plastic BPA-free custard cup lids, and a 2-quart baking dish. 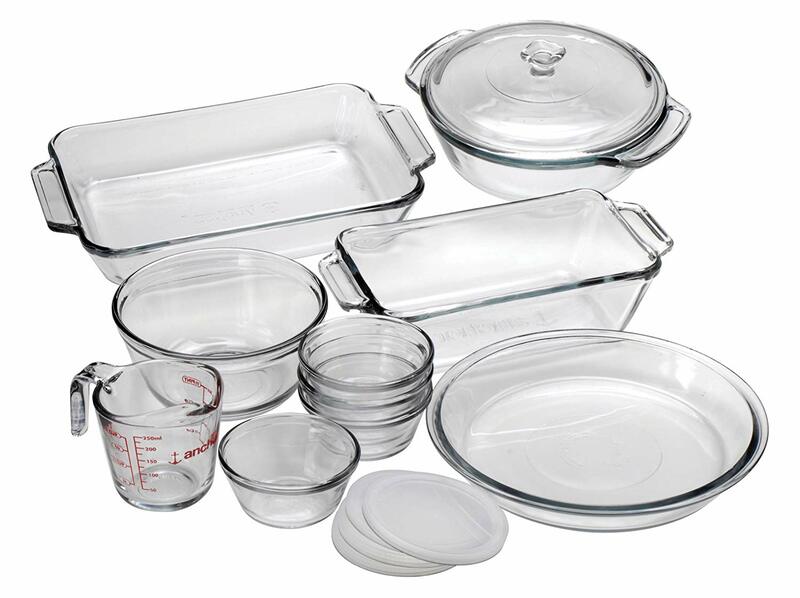 All 15 pieces of this bakeware set are made from top-quality tempered glass that is ultra-durable. The tempered glass will not warp, stain, or retain odors from baking after being washed. It can be put safely in the refrigerator, freezer, microwave, and dishwasher. 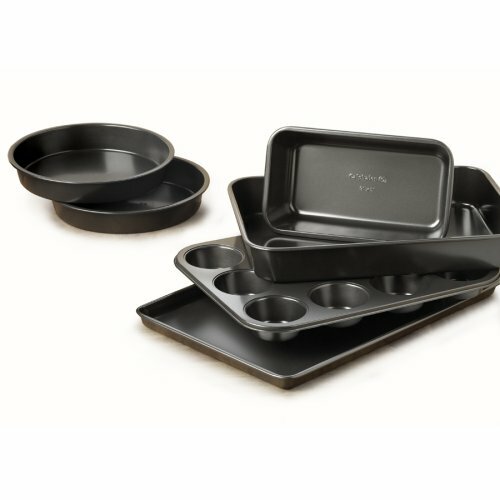 This 15-piece set provides you with all the requirements for your baking needs in one sleek, matching set. 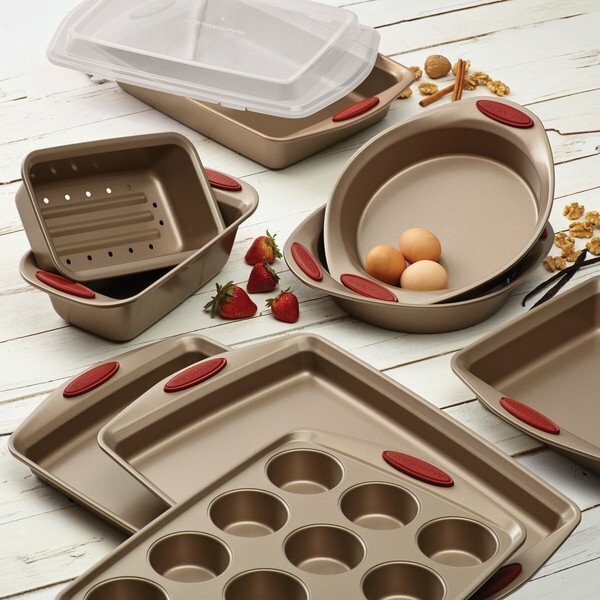 This 10-piece bakeware set includes virtually every piece you’ll need to completely any baking project in the kitchen. It even features the more obscure pieces than many bakeware sets leave out in favor of more common pans and tools. 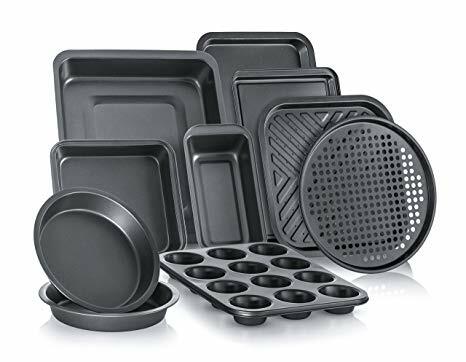 This bakeware set includes a pizza tray, a loaf pan, a roasting pan, a muffin tin, a square baking pan, 2 round cake pans, a large cookie sheet, a medium-size cookie sheet, and an oven crisper. All of the pieces in this set feature heavy-gauge carbon steel material. This durable material ensures that everything you bake in these pans will cook evenly for best, most delicious results. Plus, it’s nonstick and dishwasher-safe for easy, fast, and frustration-free cleaning.